Once in a very great while I will do a repair on someone’s mechanism – one that I did not sell them. Perhaps once every 2 or 3 years. Usually that is sufficient to remind me why I don’t do outside repairs. This particular mechanism, originally a very nice example of a Viennese month duration mechanism, is a good example of why I don’t like to take in mechanisms for repair. And, it is also a good example of why I take the time to document the tools and techniques I use in my repair and restoration work. My hope is that repair folk will be able to learn techniques that are appropriate for mechanisms like this one, and perhaps quit butchering them. Let’s see – I thought I would walk through my work on this mechanism to give an idea what I found when working on this piece. The first problem is that the owner didn’t pack it all that well for shipment. The first pictures are of the crutch when it arrived on my bench. The end of the crutch had been bent up against the seat-board, breaking a previously poorly done repair. I noted, on initial inspection, that the pins holding the anchor bridge in place were sticking through the back plate, and had been broken off, not cut as would have been likely original. So, perhaps the bridge has been moved a bit. And, the bridge has a few hammer marks on it, perhaps some gentle adjustment was done way back when. But, the thing I saw which was most instructive was that the escape wheel teeth were falling on both the dead-beat and the impulse faces of the pallets. Check out the first video below to see this. There were metal shards on the edge of one of the pallets, telling it had been “worked” at some point. At that point I knew that for some reason the escapement was not consistent, mostly in recoil mode, once in a while moving into dead-beat mode. - Home-made anchor arbor – with pivots 0.035 and 0.031 inch, over two times too big in diameter. The square section on the home-made arbor looked like it had been roughed out without the use of a filing rest and was somewhat less than “square”. And the crutch hub was soldered to the arbor. - Pins locating the anchor bridge soldered in (these were not originally soldered – and whoever soldered them did a very messy job) and looks like they had been moved at some point. Explains why they looked like they had been cut off with dikes – because they had. - One pallet face badly angled (see photo’s below) and very rough with scratches across the width. After flattening the pallets I brought the pallets back together roughly 0.18 mm, and dropped the bridge roughly 1 mm. This allowed the escapement to tick very nicely, though I knew I still needed to figure out why it was not even in its lock and drop. - Winding drum pivots - One looked like it had been polished with a buffing wheel – not a cylindrical pivot. The pivot also had a lot of scratches. The other (on the winding square end) had a saddle, the bottom of the saddle was not consistent – like flats had been cut into the pivot. The hub for the gear on the winding drum was not dressed at all. - Both screws holding the end-cap on the winding drum were replacements, and the cap had been hammered pretty extensively – as in the entire plate had hammer marks on it - not sure what that is all about. - Gear teeth all pretty-badly tarnished – but the sides of the gears nicely cleaned. I suspect someone cleaned the mechanism with very old cleaning solution and ended up plating out lead on the brass parts (a black deposit). They then, apparently, sanded the sides of the gears while spinning in a lathe (explaining the concentric fine scratches on the spokes and rim of the gears) but did nothing to clean up the teeth. - The escape-wheel arbor had been capped on one end – this might explain why the escape-wheel seems out of round. ARGH I hate those caps – especially since it means the arbor has been shortened to fit the cap – so I can not just pull it off and put in a new pivot – I would also have to extend the arbor. Or, more likely, drill the pinion and fit a new arbor. PLEASE – if you are not competent to replace a broken pivot don’t put one of these caps on instead – this is not a professional solution for a broken pivot. - Pivots ranged from decent original to very badly grooved and in several instances, looked like they had been “polished” with fairly rough buff sticks. The pivots on the “new” anchor arbor look like they were roughed out and then polished with a small buffing wheel – in terrible, but shiny condition. - Pulley pivot not touched since original – and these are usually not very nice when first made. It is really very important to stone and burnish the pivot screws for the weight pulleys. - Both pivots were bent on the escape wheel, explaining why the escapement wandered in and out of dead-beat mode. I next decided to tackle the crutch. As mentioned above, I first repaired the connection to the hub. Next I worked on the crushed end. Someone in the past had soldered on a piece of brass in an attempt to fix a previous break – as shown below. After reshaping the crutch to look more like it should, I soldered the broken joint back together. I then laid another piece of brass across the break, soldered it in place, and then carefully filed, sanded and polished the crutch. Check out the finished piece – not perfect, but a heck of a lot nicer than it was. The first picture of the anchor bridge shows how much it had to be offset to correctly depth the escapement. I reamed out the pivot hole in the bridge, plugged it, sanded the plug flush with the bridge, drilled a new hole a millimeter lower in the bridge, and then cut a new oil-sink for the pivot. And shot another picture of the bridge, post “adjustment”. 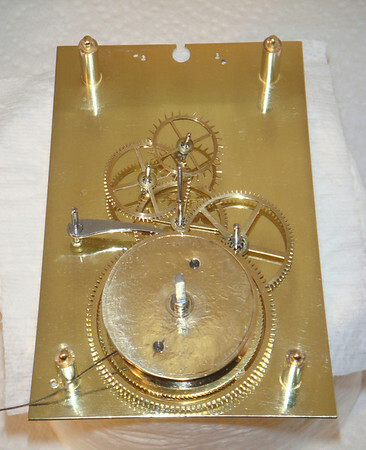 After reassembling the mechanism I found that the escapement was very finicky with regards to depthing – just the least little bit up or down from the optimal location and teeth fouled the pallets. Turned out it was specifically two teeth that were fouling – because they were bent. The second movie shows the escapement after straightening the teeth.